One of this generation's most prolific poets of protest went to Iraq for his directorial debut. with the locals, and the not-so-locals, in Iraq. In the earliest moments of Michael Franti's documentary I Know I'm Not Alone, the musician better known for fronting bands such as Spearhead and Disposable Heroes of Hiphoprisy is told by his matter-of- fact pilot that the impending, spiralling descent into Iraq may reduce the chance of being hit by a ground-to-air missile. With the camera trained on him, Franti lets out a whoop that smacks of a boy's own adventure about to begin. On arrival at the airport, he waves the local currency at the camera and declares himself rich. But Michael Franti is far from a likely lad taking all this lightly. And he's even further from a hick unaware of the world around him. Regarded by many as one of this generation's most prolific and outspoken poets of protest, Franti is a man who feels, perhaps too deeply, other people's pain. In making I Know I'm Not Alone - his directorial debut - Franti's motivation was, he says, simply to see what was happening on the ground in the Middle East. "I went there mainly with the idea of trying to understand the issues better. I've been someone who has been very outspoken about the war in Iraq from before it started and, as we were approaching the 2004-05 presidential election, I thought that to be an effective communicator as I hoped to be, I should really go and see things first-hand. "Making a documentary was almost a secondary thing," he says. "We took our video cameras and had such amazing footage that we thought, ‘We might as well make a film.'" The results has surprised even him. Already awarded the best film award at the 2005 San Francisco Film Festival, it has played to packed houses across the US. Now, on the eve of an Australian release that will see him accompanying the initial screenings and finishing the night with a 30-minute acoustic set, Franti is hoping the reaction from local audiences will be the desire for dialogue. "I don't expect this film to answer all the questions for everyone. I want it to provoke conversations at people's dinner table, at the water cooler at work. I just want people to talk and listen to each other," Franti says. That holler he gave on descent into Iraq, he says, was born out of pure fear, rather than asserting any muscle-flexing manliness. "That was my way of reacting. What else are you going to do when they say that you could be hit by a surface-to-air missile? As soon as I got on the ground, you see the realities of what's going on, and it's very sobering. The first thing that I saw as I left the airport in Baghdad was two cars that were just blown up, and there were people just hanging out who were on fire. When I lifted up my camera to take images of it, the driver said, ‘Put the camera down - if the US soldiers see you shooting it, they will open fire on our vehicle.' It was very confronting," he says. He was scared, too, when, trying to sleep in his Iraq hotel room, the sound of small-arms fire drew closer and closer, increasing his fear that someone would barge in and kidnap him. He was again scared when the bullets came too close in Hebron. "What stopped me from getting on a plane and going back home? Just an overwhelming curiosity to see what was going on," he says. Like Linus clutching his security blanket, Franti's hold on his guitar throughout the film was, he says, comforting. Some of the most tense moments in I Know I'm Not Alone are when he's forced to put it aside and stop the gently persistent strumming that he says was instrumental in getting his interviewees to share their most personal stories. "When I was asked to stop playing by someone with an M- 16, I definitely did stop. That's when I got scared," Franti says. 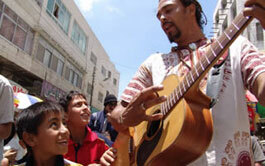 Filmed largely during a three-week tour of Iraq and Israel, the candour of Franti's subjects is impressive. "The main thing was the guitar," he says. "I would enter into a street and I would just stand on the corner and start to play, and within a few minutes I'd have 20 or 30 people gathered around. Once they saw I was there to give something, they would say, ‘Please come into my home.' Then one thing just led to another. I would ask them how things had changed since Saddam, or talk about what it was like to experience the bombing. Just the questions a lot of people would want to ask." Franti says he's been changed by what he heard. But then, the man who was adopted by white parents and raised in the predominantly black neighbourhood of Oakland, California, is used to change. Once known for angry hiphop, Franti, who arrived in San Francisco in the mid-1980s as a self-described homophobic athlete and basketballer, has already undergone a public evolution to almost naively sensitive peacenik, with song lyrics that lament "You can bomb the world to pieces, but you can't bomb it into peace" (Bomb the World). "I still feel like I'm naive about things," he says. "I came from a place where I had a strong position on issues and tried to fight to convince other people of my position. Now, I'm moving into a politic where I try to listen and keep myself open to other people's viewpoints and learn from them. That's kind of my mission now in life. Keep listening and learning from other people's viewpoints." Before he made this film, he says, he imagined that people who were living in war zones would want to hear songs that were protesting against the war. "But they want to hear songs that were about connecting to other people. They wanted to hear love songs, songs that made them dance, songs that made them smile and clap and laugh," he says. Footage of Iraqi children torn apart by bombs, Palestinians being forced from their land, and US soldiers who say they don't really want to be there has drawn the inevitable criticisms of being un-American. It's a claim Franti is quick to dismiss. "To sit back and say, ‘Oh, we're going to let the Government do whatever they want, right or wrong,' is giving up," Franti says. "I find that my questioning of what our Government is doing is patriotic." I Know I'm Not Alone screens at Cinema Nova. Carlton, tomorrow at 7pm, followed by a Q&amp;A session and an acoustic performance by Michael Franti. The event is sold out. The film opens for a limited season on Wednesday.